Victoria amazonica, commonly known as Amazon Water Lily, Giant Amazon Water Lily, Giant Water Lily or Royal Water Lily, Victoria Lily, is well known for its huge circular leaves, which are often pictured with a small child sitting supported in the center as a demonstration of their size and strength. The species is highly prized as an ornamental, despite having somewhat particular requirements for successful cultivation. 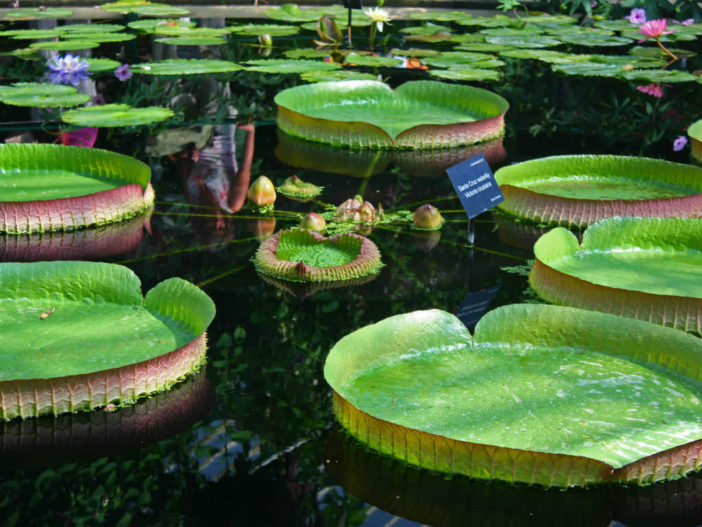 Native to tropical South America, Victoria amazonica was first discovered in Bolivia in 1801 and named Eurgale amazonica. It was subsequently moved to a new genus named in honor of Queen Victoria (originally as Victoria regia). In South America it grows in the backwaters of rivers in the Amazon basin, the Guianas and the Pantanal. Leaves: The enormous circular leaves, which grow to over 2.5 m across, have upturned rims and are anchored by long stalks arising from an underground stem buried in the mud of the river bottom. The leaves first appear as spiny heads but expand rapidly up to half a square meter per day. The upper surface has a rather quilted appearance and a waxy layer that repels water. The purplish red undersurface has a network of ribs clad in abundant sharp spines, possibly a defense against herbivorous fishes and manatees. Air trapped in the spaces between the ribs enables the leaves to float. They are so buoyant that they can easily support the weight of a small child, and a mature leaf can support 45 kg if the load is evenly distributed. In a single season, each plant produces some 40 to 50 leaves, which cover the water surface and exclude light, thus restricting the growth of most other plants. Flowers: The spectacular flowers are relatively short-lived, lasting only 48 hours or so. The flower is white the first evening it opens, attracting beetles with a sweet pineapple-like scent and with heat from a thermochemical reaction. At this stage the flower is female, and is open to receiving pollen picked up by the beetles on other plants. As they bumble around inside the flower they transfer pollen to the stigmas and fertilization takes place. Meanwhile the flower shuts, trapping them until the next evening. During the following day the plant changes from female to male: the anthers mature and start producing pollen. When the flower reopens on the second evening it has changed color to purplish red and no longer emits attractive scent or heat. The beetles, dusted with their pollen, fly off to find another white flower on a different plant (each plant only ever has one white flower at a time), where the process is repeated. The flower then closes up and sinks below the surface of the water, its mission accomplished. In the wild the giant waterlily is a short-lived perennial, but at Royal Botanic Gardens, Kew it is raised as an annual from seed planted each January. In summer the flowers are hand-pollinated and then placed in a bag. This enables easy collection of the resulting seed, in the autumn. The seeds must be kept moist, preferably in water, all the time. To prevent premature germination, or death, they are kept at a constant temperature of 15 °C. In order to begin germination it is sometimes necessary to nick the seed with a scalpel, after which germination occurs in ten days. In January the newly germinated seed is pricked out into a tiny pot which is kept in water. As the plant grows, potting on into larger pots is carried out until the plant occupies a one ton pot. Loam is used as a substrate, the key factors for this choice being that it does not float, it is rich in nutrients and it has the capacity to enclose the fertilizer that is contained in the ‘feed bombs’ given to the plant. Carlos Magdalena, who cultivates this species at Kew, notes that temperature and light are crucial. The seedlings are raised at 32 °C and the juvenile and adult plants are grown on at 26 to 32 °C. In the winter, supplementary lighting must be provided for the seedlings. A 400 watt horticultural supplementary bulb is used to give bright light for 12 hours. The brighter and longer the exposure to light, the better and faster the plant grows. Eventually, in autumn, it is the lack of light that finally causes the plant to die. Pests and diseases are kept at bay with the provision of plenty of rich fertilizer, but aphids can be a problem. If the plant becomes pot-bound, the crown tends to lift until it is raised out of the water. To counter this, the ‘chop and drop’ technique can be used whereby the crown is cut and planted in a new pot. Alternatively the pot can be placed deeper in the water. The general rule is: the larger the pot, the larger and healthier the plant. General maintenance includes weekly feeding throughout the season using ‘feed bombs’ and prompt removal of decaying leaves. The pot in which the plant is growing is kept submerged in water at all times.